Mt. Bachelor Resort is Central Oregon’s most popular destinations for a family ski vacation, offering diverse terrain, dry powder, and a variety of runs for every level of skier and snowboarder, plus on-mountain summer activities such as hiking and mountain biking. With over 400 inches of fresh powder annually, Mt. Bachelor Resort is one of Oregon’s premiere ski destinations. Mt. Bachelor boasts 10 chair lifts, 71 runs, and 3,365 vertical feet of light, dry powder covering over 3,600 acres. The mountain caters to all levels of skiers and snowboarders with 15% novice runs, 25% intermediate runs, 35% advanced runs, and 25% expert runs. Located just west of Bend in the beautiful Deschutes National Forest, visitors can enjoy breathtaking views of several Cascade Mountain peaks and lakes. Mt. 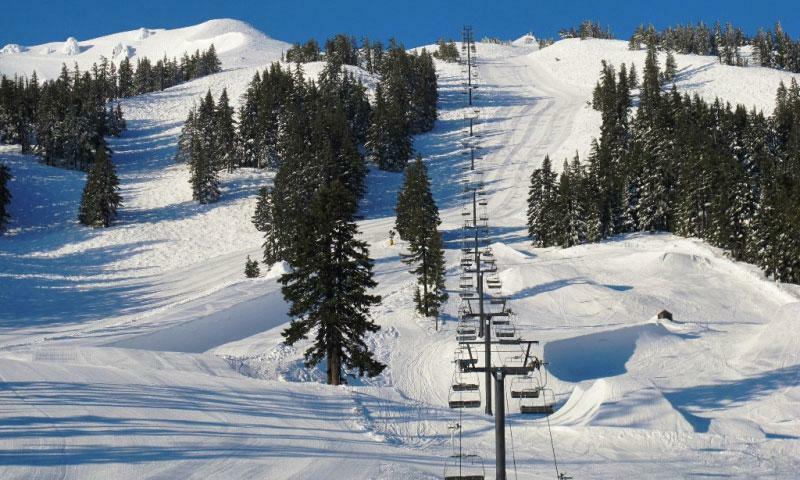 Bachelor Ski Resort, Oregon is located 21 miles west of Bend. Access is via SW Century Drive / Cascade Lakes Highway (Forest Road 46). The Mt. Bachelor ski season runs from November through May. Specific opening and closing dates vary each year depending on ski conditions. Lifts run from 9 am to 4 pm daily. Mt. Bachelor Ski Resort offers its guests a rental center, a demo center, a tuning center, a gift shop, a snow sports program that provides both individual and group lessons for children and adults, mountain workshops, telemark lessons, Nordic lessons, kids multi-week programs, and childcare. There are also 4 different lodges that have 2 bars, a coffee shop, an espresso bar, a handful of cafes, and a restaurant. Mammoth Lakes, California is home to both dramatic Sierra scenery, and fantastic skiing. Ski at Mount Hood Meadows in northern Oregon.